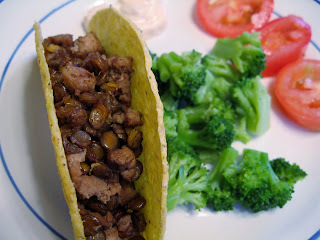 Lentil tacos were on the menu for our most recent bean challenge. The reception was lukewarm from the children, but I thought they were tasty. Don't miss the chipotle chiles in adobo sauce that this recipe calls for. You mix it with sour cream, and it gives a really smoky satisfying flavor that you can enjoy as taco topper. If you don't know where to find chipotle chiles, look in the Mexican aisle of your grocery store. It's likely in a small unassuming can, like this. I had the intent to add some Gimme Lean, which is like Jimmy Dean (see where this is going?) except vegetarian. It's a great alternative to bulk sausage. I struck out at the grocery store - I'll have to buy it at our local co-op. Instead I bought some organic ground turkey to supplement the lentils. Not that lentils need to be supplemented, it was just a thought I wanted to try. Here is the result, with tomatoes and broccoli on the side. By the way, my newest YouTube obsession is these videos by 93-year-old Clara called Depression Cooking which are recipes from Clara's Depression Era life-experience. Thanks Tina for alerting me to these. Below is an episode where Clara cooks with Lentils to create a "Poor Man's Feast". Yes - a feast AND lentils. "We have to have lentils. Lentils are not expensive, nourishing and they're good for you." And I love how thinly she slices meat. "We didn't know what thick was". Oh my gosh! I can't wait to try that 'sausage' product! And lentils are SUCH a great idea in tacos!